I read, rather incessantly if the truth be told. For me it’s primarily a way of maintaining sanity. Something about disappearing into someone else’ story or an intriguing bit of non-fiction boosts my mood and settles my oft chaotically busy brain back into less stressed out functionality. Except, since late February I haven’t read much of anything. I have been too stressed out to settle down long enough for anything to grab my interest. It’s been miserable. 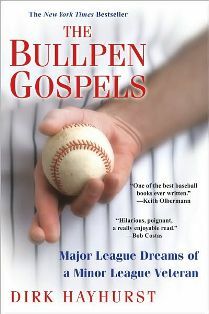 Finally, I picked up Dirk Hayhurst’s tale of minor league life, The Bullpen Gospels. I was so charmed by his turn of phrase and the compelling mix of humor and gut wrenching introspection, that I devoured it like a starving person in about two days, thus breaking up the longest “slump” of my “career.” One of the jacket quotes describes the book as Bull Durham meets Ball Four. On some levels this is true, especially on the humorous end of things. Never have kangaroo court proceedings been reported with such glee and the tales of out heckling rowdy opposing team fans are truly hilarious. But on the serious side of things, Hayhurst’s very much non-fiction back story and his personal stakes for failure are much darker and the introspection is more deliberate. After busting out of my biblio-slump, I began tearing my way once again through the stack of books to be read, and one of the first things that caught my interest also happened to have a blog tie-in. 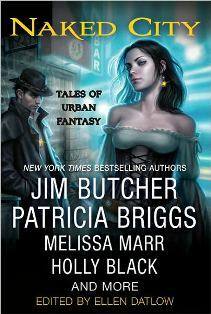 Jim Butcher’s “Curses,” a new short story in the Dresden Files series included in Ellen Datlow’s recently released urban fantasy anthology Naked City. In this story we find Harry Dresden, detective, warden and the only wizard in the Chicago phone book taking on the Cubs’ Billy Goat Curse. And the end result? A very fun read. I had no idea Butcher was a baseball fan and if he isn’t, he fakes it nicely. This is a lighter Dresden tale, as Butcher often chooses to share in these anthologies, and would be relatively easy for someone who hasn’t read the series up until now to pick up. And if you had the misfortune of watching the Sci-Fi Channel’s terrible TV series adaptation of these books, don’t worry, the books are a completely different animal. Speaking of books and baseball, there was a really cute news feature in one of the early July episodes of Angels Weekly showing Angels rookies Hank Conger and Mark Trumbo and recent rookie Peter Bourjos car pooling to the interleague games at Dodgers Stadium. The adorable part was how nonchalant and professional they were trying to be about having reporters videoing their ride, when it was obvious they could barely contain their glee over the very Big Leagues novelty of the whole thing. One day before class during my sophomore year, I had just put down a book I was reading to joke around with a group of baseball players, a fairly typical day. The guys were teasing me about my reading habits, mainly that I had them. I was the stat girl for the varsity team and had gone through grade school and then some with most of these JV players. We were friends. The teasing was affectionate and I was giving it right back. “Did your parents brainwash you or something?” asked a guy I had known literally since preschool. “Yes, and once you get past the machine that holds your eyes open really wide, the drugs are actually kind of fun…” I responded, or something to that effect. Old friend kept it up and I finally asked him if there was any book he would willingly read. He pretended to gag and loudly protested, of course not. And all of the baseball players predictably laughed. Yeah, the boy didth protest too much, especially to someone who knew about his extensive Darth Vader collection. 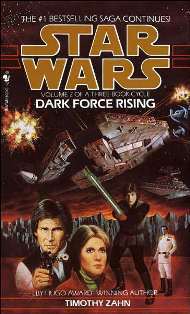 Fortunatley, timing was on my side and I held aloft the recently released book to reveal the shiny new cover – Timothy Zahn’s Dark Force Rising, the second book in the very first Star Wars series to tackle the question of just what happened after the conclusion of the original movie trilogy. Old friend emitted what can only be described as a squeal of delight and practically dove over a row of desks to get a closer look. “Oh my god! It’s out! I didn’t know it was out yet! Is it good? The last one was so good…” and so on. And he wasn’t the only one. Bwa ha ha. The moral of this story? Careful Bourjos and Trumbo. Reading isn’t everyone’s cup of tea and there’s nothing wrong with that. But someday you may just find that one book that has you diving over a desk and looking silly, LOL. My father-in-law discovered Michael Lewis this Christmas. One relative gave him The Big Short: Inside the Doomsday Machine, Lewis’ new book on the mortgage meltdown and my husband and I loaned him Liar’s Poker, Lewis’ first book about his early career as a Wall Street bond trader in the 1980’s. He’s really enjoying The Big Short and we got into a huge discussion about both books and all things Michael Lewis over the weekend. And, of course, you can’t talk about Michael Lewis without talking about Moneyball, or at least I can’t. In talking about on base percentage, slugging percentage and other at the time undervalued stats Lewis dedicates a entire chapter each to A’s acquisitions Jeremy Brown, Scott Hatteberg and Chad Bradford. Each player exhibited one or more sabermetrically valuable skills while lacking many of the qualities that Major League Baseball placed a high value on. In the course of outlining the different ways this situation made each player a brilliant bargain for Billy Beane’s larger vision for the A’s an entirely different argument emerges. In telling their stories, Lewis’ also describes a crucial unexpected personal element that helps each player achieve success. Brown, for example, is a talented hitter who suffers from the fragile psychology of the chronically picked on kid. In Lewis’ telling, once Brown makes the first jump away from the A’s rookie team, he is on the verge of crumpling from a lack of confidence when his friend, the much more socially adept Nick Swisher, gives him the encouragement he needs, a sympathetic ear and a one-man cheerleading squad in the dugout. Scott Hatteberg’s story is my favorite. A former catcher with a damaged elbow that destroyed his throwing arm, Hatteberg’s high on base percentage brings him to the attention of the A’s who want to retrain him as a first baseman. What the A’s have no way of knowing is how much Hatteberg’s love for baseball is built around the chats and personal interactions he had with the opposing teams’ batters when he used to catch. What I took from Lewis’s argument is that, more than the desire to excel at baseball again, it was the realization that he could have that same level of personal interaction and possibly even longer conversations with opposing players as a first baseman that gave Hatteberg the drive he needed to learn the challenging new position. Hatteberg’s personality becomes a real asset when Chad Bradford begins pitching for the A’s. Lewis describes Bradford almost crumpling under the pressure of past manager’s reactions to his quirky submarine pitching style until Hatteberg gives him a timely confidence boost by sharing the hitters shocked and impressed reactions to the pitches when they reach first base. I assume that Lewis’ point in sharing these stories is that they are great stories which bring a compelling personal element to the book. But after reading them, I for one can’t imagine any of the players functioning in the way Beane felt their stats indicated they would perform if the intangible qualities in the player and/or their teammates weren’t there right along with the tangible ones. I know this is not what Lewis intended to argue at all, but the argument is there nevertheless and largely, I think, becuase you can’t escape the importance the human element plays in baseball no matter how you crunch the numbers. As to the unintentional argument about the passion of baseball fans, one of Moneyball‘s biggest controversies is the perception that Lewis argues in favor of new sabermetric stats hands down over traditional stats. This isn’t Lewis’ original argument at all. He starts out by saying that sabermetrics allows managers to pick and choose undervalued skills, the skills that can give a less wealthy team the most talent for their limited dollars. His central premise is not that a team with relatively unlimited resources should prize these undervalued skills over traditionally valued skills…but it sure doesn’t sound that way by the time you get to the draft scenes in the middle of the book. Lewis begins to praise the skill sets the A’s have chosen to focus on to a greater and greater degree as the book progresses. He brings things back around to his central point by the end but seems unaware of the degree to which he strayed from it in the middle…and, understandably, it is the points where Lewis strays that the book’s detractors fixate on. Why the discrepancy? I think Lewis’ own obviously growing enthusiasm and occasional downright giddiness in describing his subject tells the whole story. By the end of his research, Michael Lewis has evolved from an interested but unbiased researcher into passionate baseball fan. And who among us really sounds logical and reasonable once we start talking about our team and their chances in any given season? As much I appreciated Lewis’ sabermetrics history and analysis of the new stats, to me the combination of his intentional and unintentional arguments cuts right to the heart of baseball. The stats are important. The stats give you an amazing amount of crucial information. The newer stats give you even more. But the stats can never and will never tell you the whole story. I hope my father-in-law asks to borrow Moneyball soon. I want to discuss this with him and see if he thinks it compares to gut instinct vs. in depth market analysis on the stock market. I’m relatively new to MLBlogs so I’m still discovering new shiny things every time I visit. This weekend it was the Baseball Books blog. A little infrequently updated – which I understand – but a great concept. I really liked the what is your most precious baseball book post from April, but it was so old I hesitated to comment. Still, that post got the question spinning around in my brain and I figured I would answer it here. My most precious baseball book is kind of an odd choice. It isn’t valuable. It isn’t even necessarily good, but it was my first: Remembrance of Swings Past by Ron Luciano. It’s a part memoir, part historical baseball trivia book written by a former major league umpire. Allow me to explain, my father has a head for trivia, one that I’ve inherited. We like to joke that no factoid is too trivial, no random piece of data so inconsequential that our brains will not latch onto it forever at the expense of a lot of, quite frankly, much more important information. We come by it honestly. My grandfather was a similar repository of useless but intriguing information and I can only assume that in each generation going all the way back to Ireland there was at least one gleeful collector of random facts. Hey, as family heritages go, it’s less painful than low arches and a lot less responsibility than a decaying manor house in a far away land – I’ll take it. For this reason my sister and I gave our sports loving dad this book, a Joe Madden football trivia book and, if memory serves, one of the Far Side Gallery collections (How’s that for a trip in the way back machine boys and girls?) for Father’s Day one year. I was a kid who always had to have something to read to the point where, when new books were lacking, I would start rereading old books, peruse the encyclopedias (no joke! ), or pick up pretty much anything my parents left lying around the house (Side Note: Parents, don’t worry if your kids do this. Your 10 year old isn’t going to learn anything from Danielle Steele, etc. other than that “adult situations” are really kind of boring until you’re old enough to figure out that boys don’t actually have cooties.). A lot of the stuff my parents left lying around the house was boring – see side note – but Remembrance of Swings Past was not. It played to my love of baseball and growing interests in history and trivia. Besides, it gave me all kinds of questions for my father and grandfather (the original Angels fan in the family) and I will treasure those conversations forever. I will also always remember the books often hilarious stories about the Mad Hungarian, The Bird, the “auspicious” debut of the Kansas City Athletics green and gold uniforms and much more. Remembrance of Swings Past is neither the best baseball nor the best trivia book I have read, but it gave me a lifelong love of both.